This 19 cu ft Kenmore bottom freezer refrigerator puts the fresh food you use most at eye level for easy access. This model boasts big style for smaller areas with its 30-inch width that lets you have the French-Door design when you have less room. This unit is also big on energy savings with its Energy Star qualifications and LED lighting that saves much more on energy costs when compared to the standard incandescent lighting. 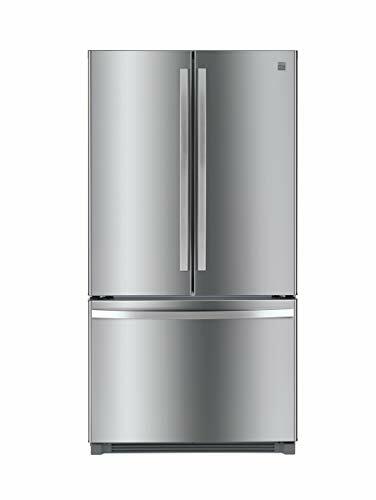 And you can forget about refilling your ice trays because with this bottom-freezer refrigerator you will have plenty of ice on hand for entertaining and daily use with the factory-installed ice maker. - Item dimensions are length 33.37 by width 30.0 by height 65.5 inches. Measure the available space to ensure the item will fit. Size 26.1 cu. ft. 19 cu. ft. Domestic Shipping Item can be shipped within U.S. Item can be shipped within U.S.